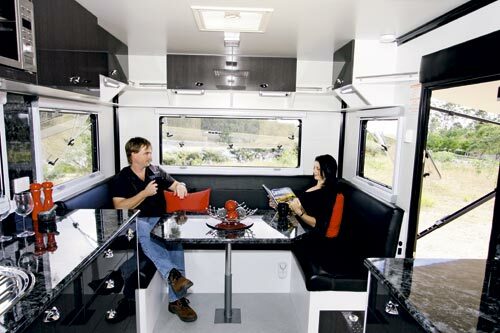 JET Caravans is a new name in the caravan industry. 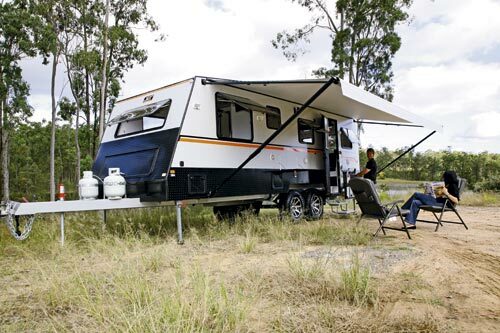 So new, in fact, that some of its vans were first seen at the Brisbane caravan show in June 2013. 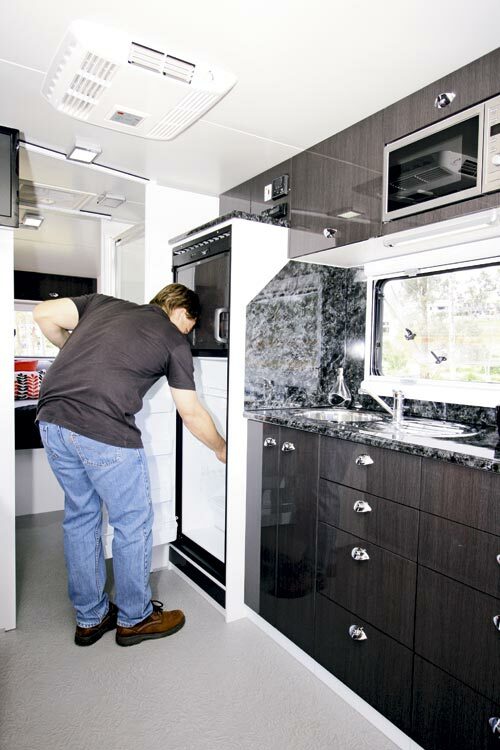 JET’s owners are new to the RV industry. 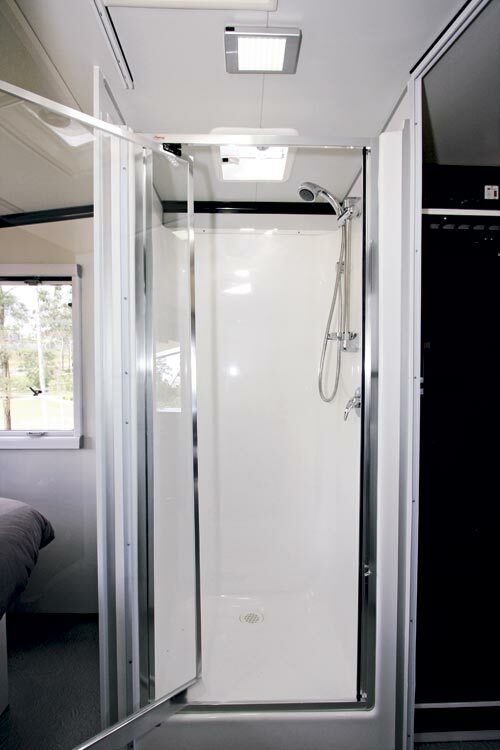 Manager John Sengstock said the company had a solid background in portable buildings – they’ve more or less just decided to add wheels! 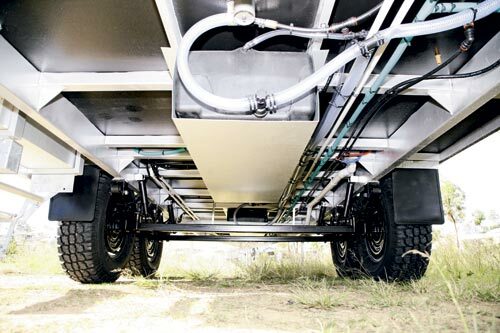 Underneath the van, the 150mm-railed DuraGal chassis is built in the standard box-section style but with a little less cross member steel than usual, utilising flanges between the main rails and cross members instead. The plumbing and electrics stand out due to the way they are neatly strapped up out of the way. More standard is the 3.5t Rocker Roller leaf-spring suspension, which comes with shock absorbers on all the 16in wheels. The polished alloy wheels with black inserts look quite smart and they match the satin black of the waistline checkerplate quite well. Above the chassis, the bodywork with its external cladding of Colorbond steel looks good in a grey finish. 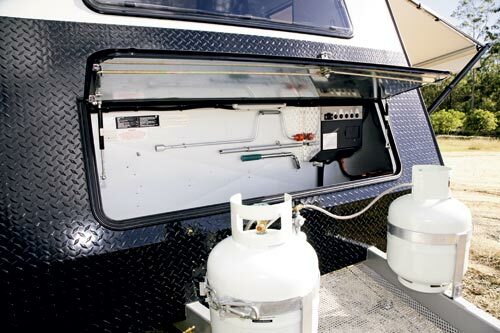 There’s no shortage of storage bins – in addition to the traditional front boot, there are front and rear tunnel boots and a generator storage compartment. 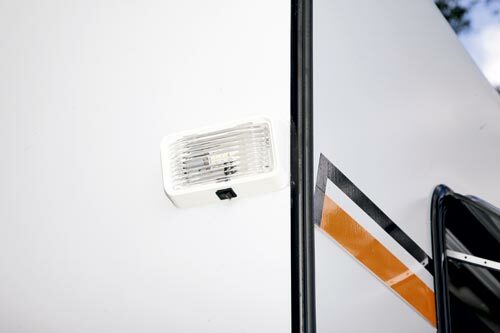 Most importantly, the nearside rear bin holds a slide-out barbecue. 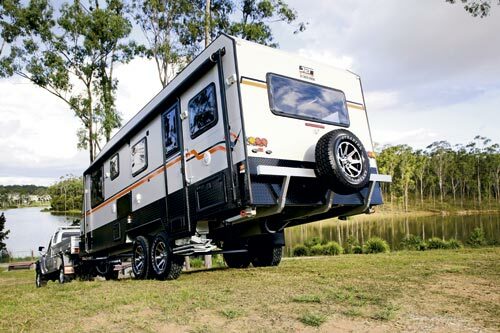 The Stealth weighs in with a Tare of 2620kg and a ball weight of 220kg, which puts it in the mid-to-large 4WD tow vehicle category – especially as it comes with an ATM of 3400kg, giving it nearly 800kg of load capacity. 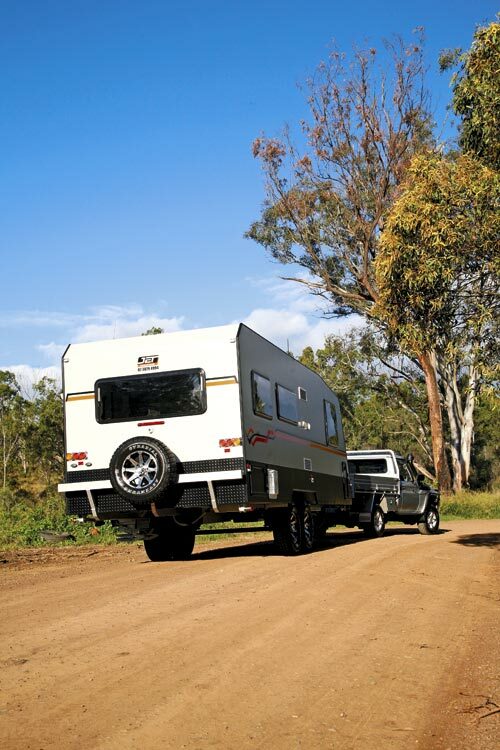 But that does not mean your tow vehicle will need a maximum towing capacity of 3400kg – unless you load the van up that much! On the road, my 70 Series Toyota LandCruiser handled the Stealth without a problem. Despite its length and weight, it wasn’t a difficult towing proposition at all and it manoeuvred without a problem. Entry through the rear door reveals a classy club lounge, which makes full use of the large windows, across the back of the van. 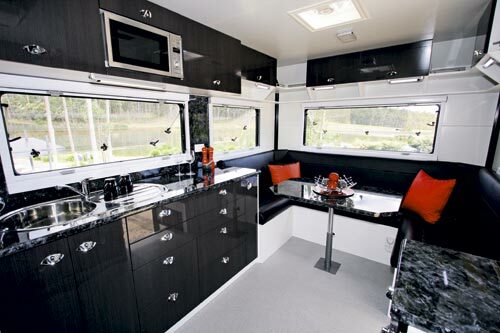 The kitchen bench is split across both sides of the van’s midsection and, further forward, the bathroom is also split, leaving the front of the van for the island bed. One of the assets of this layout design is that the bedroom and bathroom are kept separate from the main living area. 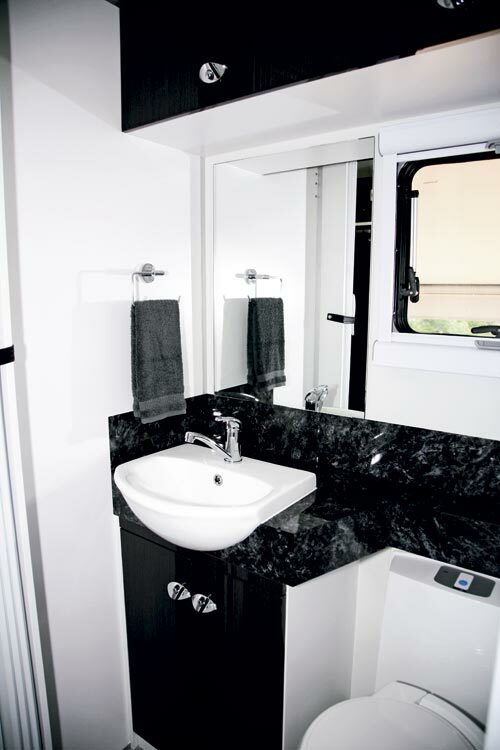 The interior décor uses contrasting colours of black, white and grey. But it doesn’t have the stark contrast sometimes seen in monochromatic schemes. There are quite a few things that are very right with this van, and not much at all that’s wrong with it. It’s also good to see a manufacturer stepping away from the conventional way of doing things. 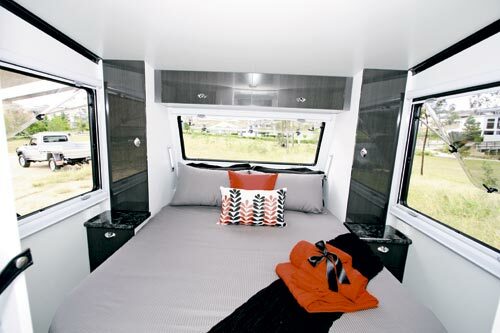 Inside the van, the layout suits a relaxed lifestyle with plenty of internal space for all the necessary items. I don’t think JET is aiming to be a volume manufacturer but the first Stealth shows plenty of promise – not just for this model, but for the other vans that are on the drawing board.